Hi everyone, my first post, sorry it's a negative one. Having bought a second hand violin on auction site, it was very very cheap, so took a punt. 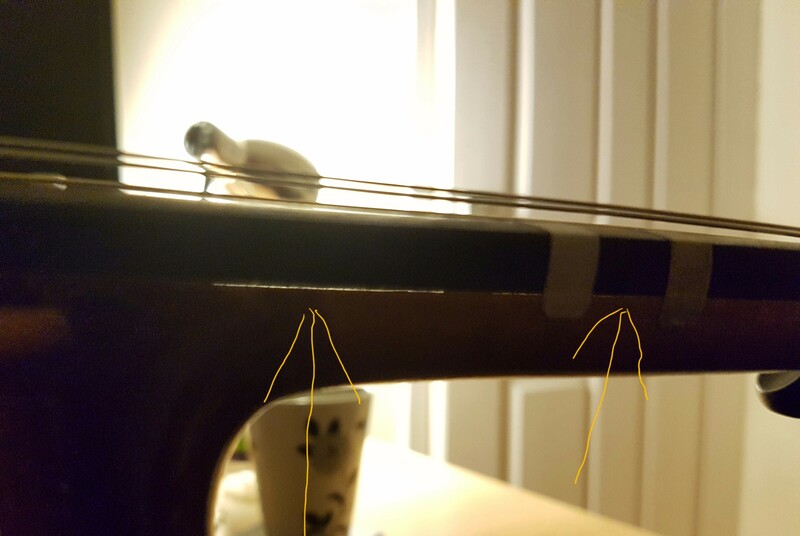 I can see day light under most of the fingerboard and the hole fingerboard is canted to the E string, nut is also not level, looks like the neck wasn't planed level. I intend to return for refund, I'm worried about the Stentor products, they seem to get glowing reviews. Welcome to the forum @Longstride46 - sorry to hear about your purchase! I'm not familiar with the Stentor range, other than yes, sure, I've heard them talked about and seem generally to be a reasonable beginner's outfit - in the sense of you-get-pretty-much-what-you-pay for. I cannot believe what you are seeing there is representative of the original build by the company - if that was normal - they wouldn't sell any at all. My own suspicion is that somewhere along the line (previous owner(s)) it has come to grief and suffered from a really, really poor home-made repair. And good luck with the next one ! I agree with Bill. It won't have come from the factory in that condition. Definitely looks like an amateur repair job. That being said, I am not sticking up for Stentor products. We decided not to sell them because we saw too many problems that needed to be addressed. Ah OK, the seller offered to do a partial refund, so ends up being £20, $26. Maybe I'll keep it it as a wall hanger. I now have a hindersine Piacenza, sounds much better, not so bright, even with same strings Pro Arte. 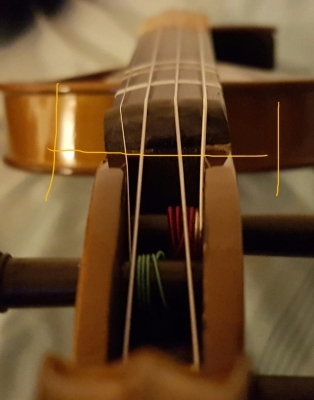 Also the finger positions don't have to shift towards the bridge to stay in tune as I play on higher strings. Hmm. glad to hear you at least got a partial refund. Good luck with your new companion ! Heyyyy - out of interest - I notice you referred to the final cost as being quote "so ends up being £20, $26." I'm from the UK, sunny Norfolk. I must update my profile, bit lacking. COOL !!!! Another UK member !!!! Glad to hear it. It might not be hard for you to get your money back on it later. Very good seller, gave full refund, and I was able to keep as a free wall hanger. My bad luck continued with the new violin, hindersine Piacenza. The varnish is not cured, it's now covered in deep scratches, I think it's my finger nails, must have been full moon. I'm actually really careful with handling, but the varnish is very very soft and is not durable. Chinrest was stuck, most of the varnish came off with it. The set up is decent, apart from the pegs, don't really fit to far into the second hole, so they slip. This it's on its way back to the UK importer / distributor, the MD, CEO wants to inspect it. If you buy very very cheap used violins, what more can you expect? Good luck with the next violin. LOL @stet - and - feeling sad for @Longstride46 and the issues you are encountering. 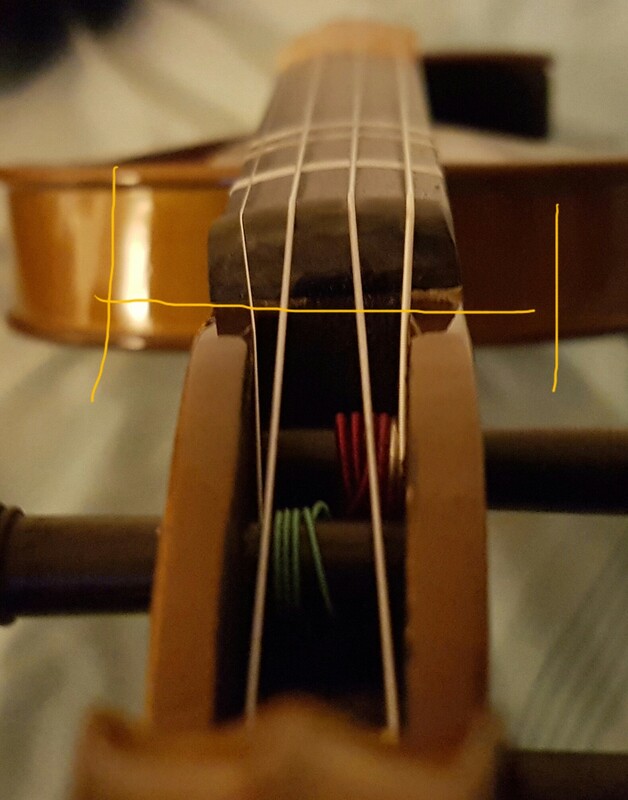 As it happens, she is a 3/4 size fiddle. I normally play 4/4, but this seemed too good to miss - and I had been watching - and communicating - with sellers of other "possibles" for around 6 months before I decided on this one. She ( Yabé ) although perfectly playable is not my "instrument of choice" - I'll generally play one of my other three - but - she does get at least a couple of hours exercise per week ! I wish you success in your quest to get "value for money" longstride... new kit should NOT be like that. Sorry, I should have said I obtained it very very cheaply due to lack of bidders in the auction. I didn't mean very very cheap in regards to quality, as I agree.. You expect trouble. I think, even at $200 USD, it is still a gamble on what you will get for a violin. The Cecilio CVN-500 I bought feels like a rather solid build, plays well, and sounds okay for a beginner instrument... but the varnish was a slop job. Still, it could have been worse, and the flame patters are really nice, better than the the flame patters I had seen on the demo models. I like doing things myself. Quite often, I do a decent job at whatever I put some effort into doing.